We have kept pedigree Highlanders on our small farm for 30 years. They are wonderful animals - very handsome and lovely to look at, very hardy, long lived, good mothers, and of course produce wonderful beef. With proper handling and care, Highland Cattle are good natured, and easy to manage. They are well suited to "environmentally friendly farming systems" as wildlife conservation and habitat enhancement are two our our priorities here on the farm. Our cattle give us a great deal of enjoyment - they are smart, come when called, respond to their names, and are easy to work with once they trust you. Most of ours are happy to meet new people and enjoy being combed and groomed. So they are happy cattle, living laid-back stress-free lives. Management Our cows usually calve in April, outside where possible. Male calves are castrated soon after birth or when 8 or 9 months old with only the best being kept as potential bulls for future breeding. All the heifer calves are haltered after weaning when 8 or 9 months old, and many of our adult animals are quiet enough to be haltered in the field. Highlanders are a beef breed, and suckle their calves until they are weaned at several months of age. Having evolved as a breed in the western highlands and islands of Scotland, where weather and conditions can be harsh, they are very hardy, growing thick coats for the winter. So they are ideally suited to living out in winter although obviously some sort of supplementary feeding such as hay is needed when grass is not growing. 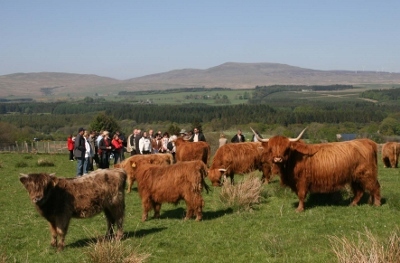 Active and excellent foragers, Highland Cattle do best where thy have plenty of scope and space to graze, and are well suited to extensive rough pasture. The breed is often used for conservation management grazing on nature reserves/wildlife areas in Britain as well as in other European countries, where it is much appreciated for its hardiness, good temperament and quality of beef. Our fold has been built up over the years based on the best bloodlines available to us - we breed for conformation, ease of calving, soundness of hoof, good mobility and breed character. We also breed for good temperament. Health status - IBR BVD Johne's accredited free (Hihealth-Herdcare) and checked annually for Lepto. Young breeding stock usually available for sale. Please Contact us for more information. Educational farm tourism - Thank you to all our lovely visitors this year. However the farm is now closed to visits for the winter months until late April 2018. We are accepting enquiries and bookings from tour companies for next year, 2018. Visitors from overseas are often very keen to see and photograph Highland Cattle at close quarters. Any company interested is advised to contact us and we will explain what we are able to offer. Contact with livestock is always under careful supervision and designed to match the interests / experience of visitors. We are also fully insured. We very much regret that currently we are unable to accommodate family groups as we do not have the staff or resources and apologise for any disappointment.